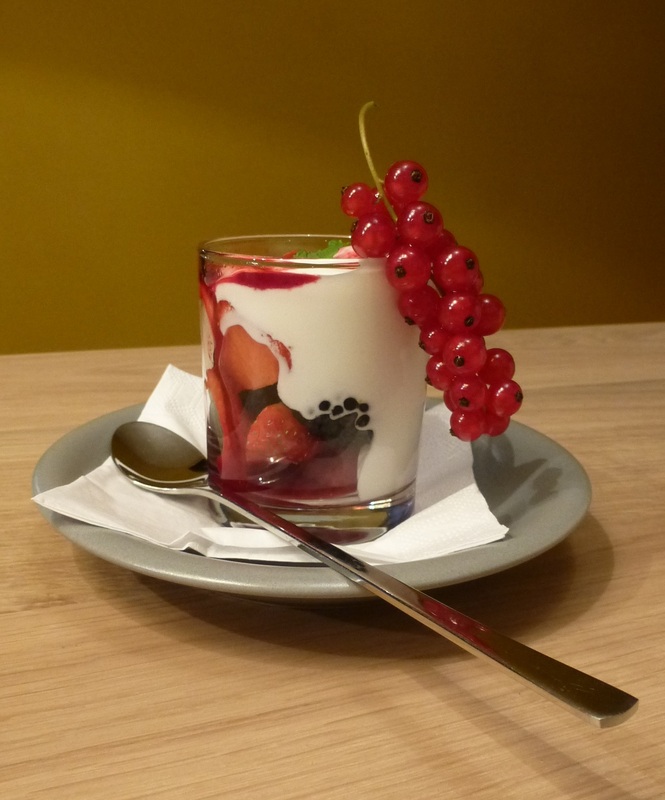 We recommend to make this dish in a larger quantity. Cooking vol-au-vent is rather messy and greasy. Once you’ve done the vol-au-vent, you can easily freeze it in portions per person. Put the cleaned and coarsely cut- vegetables (onion, celery, leak, garlic, carrots), the herbs (thyme, cloves, bay leafs, pepper & salt) and the chicken stock in a big cooking pot and add enough water so that not only the vegetables, but later also all the chicken will be covered with the stock you are now starting to make. 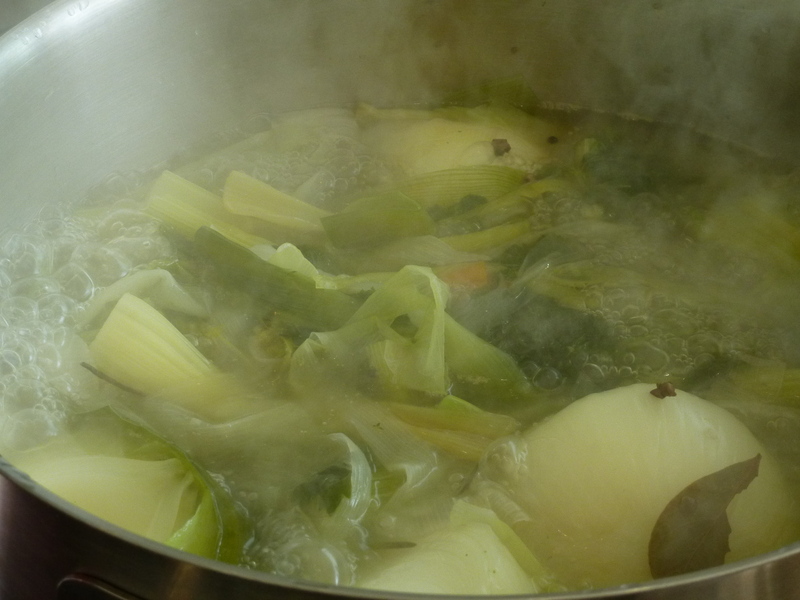 Boil the stock until the vegetables are soft. 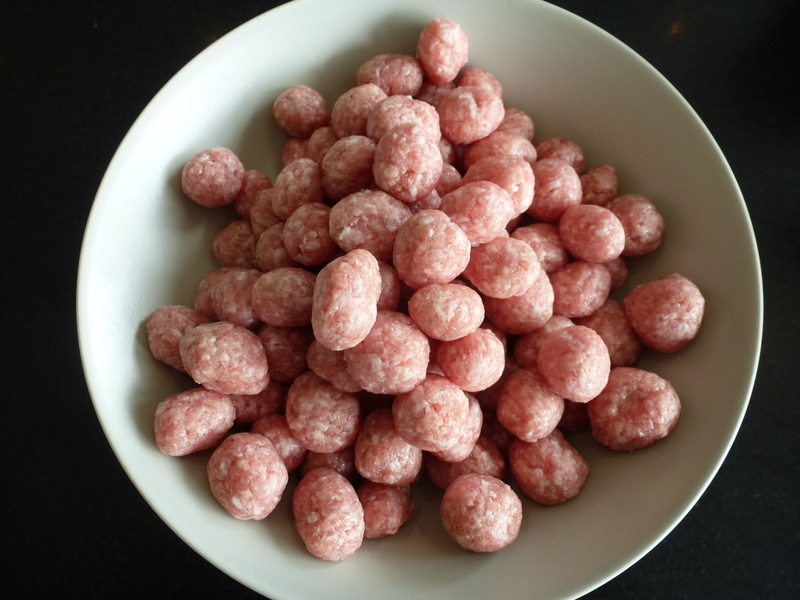 While your stock is cooking, you can roll balls of the minced meat (2-3 cm diameter). 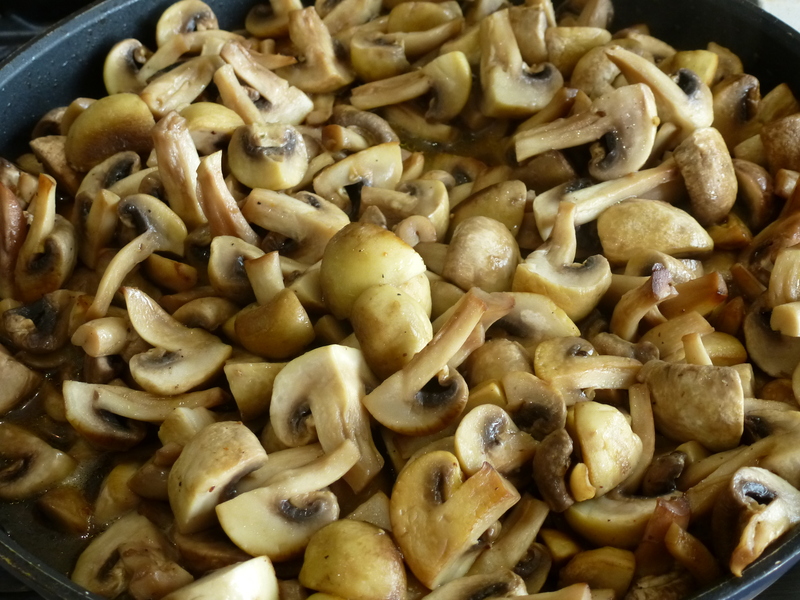 Cut the mushrooms in 4 and stew them in olive oil with pepper and salt. When they are starting to change color and going brown, sprinkle the juice of one lemon over the mushrooms to keep their light color. Turn of the heat when the mushrooms are ready. Put a couple of spoons from the stock (which is in the making in your large cooking pot) in a smaller cooking casserole to boil the meatballs just for a couple of minutes until they are cooked. This fluid we will not use further because it becomes greasy from minced meat. So use not more than needed. When the vegetable in the stock are tender, add all the chicken you have and cook for one hour. Check the chicken tenderness; it should be coming of the legs easily. Now take out all the chicken of the stock and cut the chicken into pieces. If you don’t like bones at all, peal the meat from the bones. We tend to leave in the legs and the skin of the chicken in the stew, but that’s a personal preference. We like the chicken pieces rather large than cut to bite size. The breasts we cut up (or tear-up) a bit smaller. Choose a new large pot. In this pot you will make the vol-au-vent sauce, so it should be bit enough to take the mushrooms, the meat balls, all the chicken and the ham. Start by making the roux for the sauce. Melt 250 g of butter (make sure it doesn’t burn), add flower gently and stir with a whisk. You will see that the mixture becomes dryer as you add more flower. The roux should smell like a pastry dough, like the French ‘bisquit’ dough. Watch out not to burn the roux. Don’t stop too early with the flower. 250 g of flower will be too much, look at the consistence of the roux while stirring to determine when to stop adding flower. Use a large spoon to transfer stock from you large pot to the pot with the roux and stir constantly. The sauce will start to tie when the substance cooks. When it starts to thicken, add cream until it is nice and white. Make sure you control the heat, dim the fire if necessary and don’t forget to stir. Add more stock to come to the right thickness of the sauce. When the sauce is made, add the juice of 1 to 2 lemons. Taste is the key here. 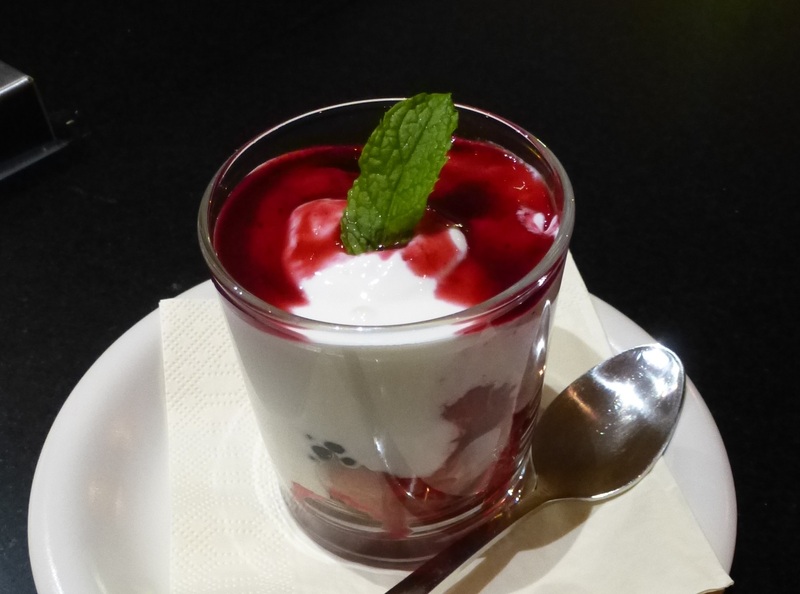 The lemon should lift the sauce, but should not dominate the taste. Cut the ham and add the ham, the chicken, the mushrooms and the meatballs to the sauce. Done! Don’t be afraid to spice the stock. Pepper & salt, herbs from the garden, are indispensable to flavor and deepen the taste of the stock. Minced meat is well spiced with salt & pepper in Belgium. If you know the minced meat in your country is not spiced, then make sure to mix it up with enough salt & pepper beforehand. The rest of the stock you can pass through the kitchen sieve and use as a basis for soup. 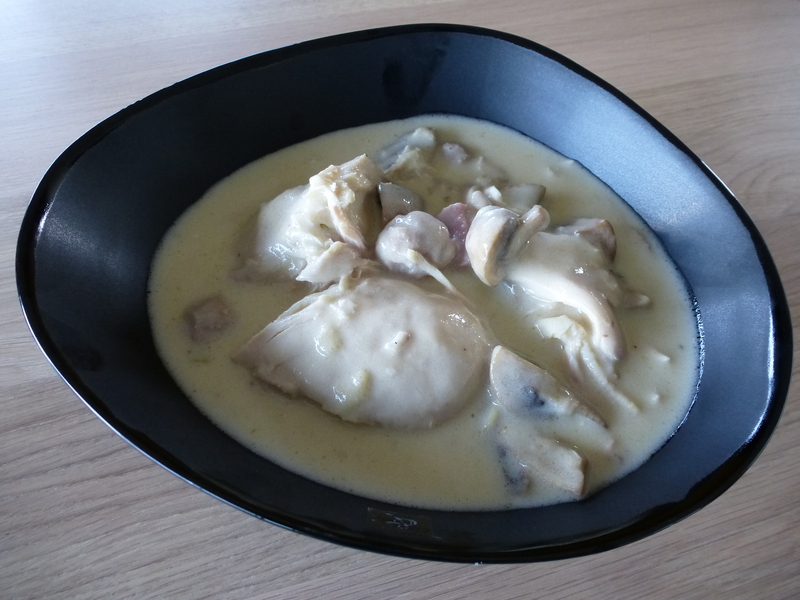 Vol-au-vent sauce you can make really thick or runny, depends on how you like it. Vol-au-vent is often served in a puff pastry, but that’s optional, you either like it or you don’t. You can serve vol-au-vent with cooked potatoes, croquettes,… but for a Belgian it is inevitable to serve with Belgian fries and mayonnaise.